The Intermediate school in BESGB is composed of three Intermediate classes which are Int. I, II and III. These classes follow the program set by the Lebanese Ministry of Education. By the end of Int. 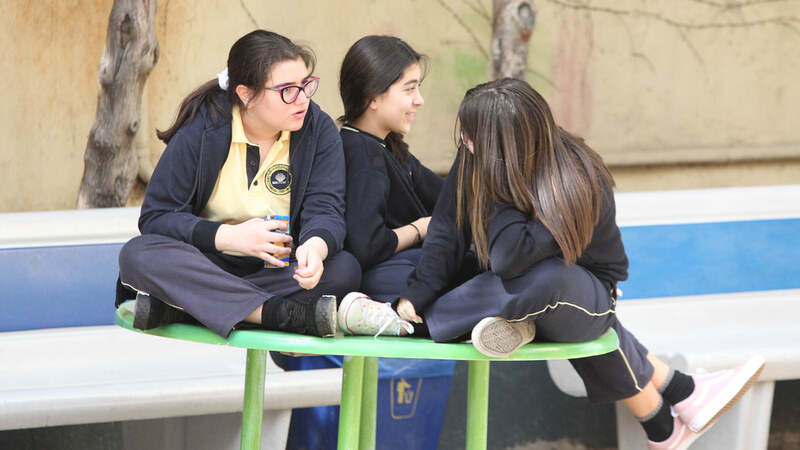 III scholastic year, students sit for the official exam (Brevet). Students in these three classes with minimal knowledge of French are given a special French course in separate classes with a specialized teacher. Subjects taught in these three classes are Arabic, English, French, Math, Biology, Chemistry, Physics, History, Geography, Civics, Physical Education, Christian Education, IT, Drama. Grades VII, VIII and IX are three classes that follow the American High School system. This system is open for students who have satisfied the requirements of the Arabic exemption set by the Lebanese government. Students in these classes take special Arabic and French courses with the help of specialized teachers. Subjects taught in these three classes are Arabic, English, French, Math, Sciences, Social Studies, Physical Education, Christian Education, IT, Drama. Students in the Intermediate section get familiar with the SAT (standardized test) by being introduced to PSAT (Preliminary SAT). PSAT is a terrific way to familiarize students with the structure, content and process of taking the SAT. Grade 9 students sit for the PSAT towards the end of the year. GC LAU MUN which is an innovative educational program that engages middle students in an exploration of current world issues. DELF which is an official diploma given by the Ministry of education in France. Our goals as educators in the Intermediate school is to accept students as they are and help them accept themselves, believe in their capabilities and talents, and improve. We also encourage students to accept others and respect their identity and differences. We also identify students who have learning disabilities and weaknesses early in the scholastic year and they receive special attention and help from the school counselor, teachers and parents. Form a civilized and educated citizen. Recognize the learner’s abilities and trends so that he can easily join and fit in life. Acquire skills so that the learner can commit himself totally to citizenship values. Complete learner’s knowledge and education to help him open to his objective and intellectual consciousness. Strengthen the learner’s communication skills until he reaches perfection. Enrich the learner’s terminology and expressions. Promote the learner’s self-confidence and help him to be independent in his thinking so that he can balance between his freedom and responsibilities.